This third DVD in the ‘Somme’ series concludes the examination of the campaign, focusing on the final two months of fighting. As in the previous films, Ed Skelding acts as presenter with Nigel Cave as the expert on the ground with him. The format of the previous DVDs is also followed; the two men are on the battlefields visiting key places of interest as Ed provides some general voiceover and quizzes Nigel on the course and conduct of the campaign. The film opens as the British seek to capitalise on the gains made in two months of bloody fighting by utilising the new invention of tank to break the German line on a 7,000 yard front between Flers and Courcelette on 15th September 1916. Cave provides a useful introduction to the tank as a weapon, focusing on its limitations and the impact that its use achieved. Whilst the psychological effect on Germans may have been high, in practical terms the nature of the terrain – churned up by over two months of shelling – impeded its overall success. Cave argues that the tank did not radically change anything at this time. Whilst positive local achievements were made (such as in Flers itself, with the 41st Division), overall its impact was limited, and the development of artillery techniques had more of an effect. The film progresses chronologically to look at the course of the campaign thereafter, including the Battles of Thiepval ridge, the Ancre Heights, and Le Transloy ridge. Some of thw well known locations on the battlefields are visited, such as the Butte de Warlencourt and the site of the Schwaben Redoubt. There is a brief look at the role of the Royal Flying Corps during the campaign, before moving on to the Battle of the Ancre and the success of the 63rd Naval Division in finally capturing some of the objectives from 1st July, the 51st Division at Beaumont Hamel, and the effective use of the creeping barrage at Redan Ridge. The narrative is interspersed with personal accounts and also covers other aspects such as the ‘shot at dawn’ executions. The landmarks (such as the memorials and cemeteries) are used as the basis for much of the talking, and the film ends with a brief overall analysis of the campaign and Haig’s command. I do feel the series title is somewhat misleading – this is not a guide to walking the battlefields as such, as may be interpreted from the title – and better use of maps and tying the discussion into particular areas, rather than ‘general’ shots of the landscape, would have been more effective in my opinion. 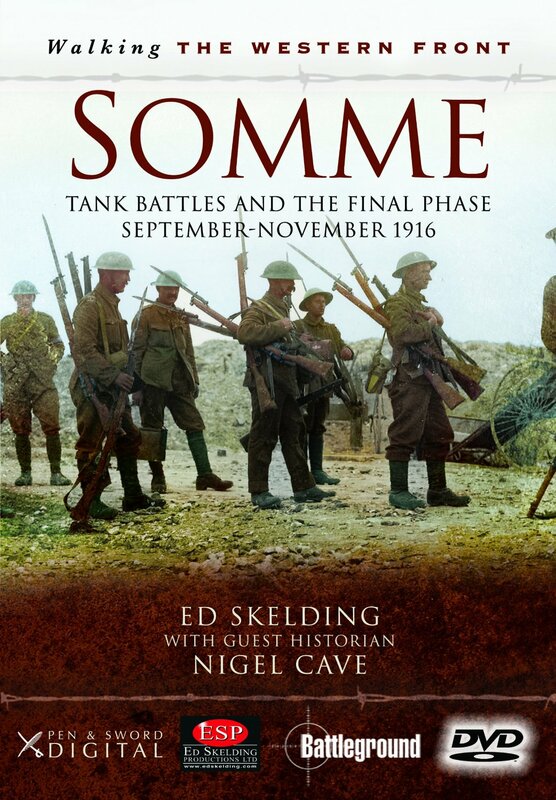 Nevertheless, for those with an interest in the Somme campaign, the DVD provides a useful introduction to the latter stages, gives a visual flavour of the landscape and features, and Cave provides a good amount of detail around the course and conduct of the campaign.